February 2013 ARPANSA’s fact sheet 14 "How to reduce exposure from mobile phones and other wireless devices". Parents from WiFi in Schools Australia contacted ARPANSA to find out how this recent ARPANSA recommendation should be applied to schools. Click to view email. ARPANSA’s response is that they do not regulate policy in the education department and that the RF Standard includes a requirement to minimise unnecessary or incidental exposure to RF EMR for the general public (the advice on the above fact sheet is in accordance with this minimisation clause of the ARPANSA RF standard). ARPANSA state “It is up to the schools to apply the precautionary minimisation requirement in the ARPANSA standard as they see fit.” Click to view ARPANSA response letter. Australian Radiation Protection Nuclear Safety Agency (ARPANSA) is the government agency which sets the safety standard for human exposure to radiation. ARPANSA standards are based on the 1998 guidelines of the International Commission on Non-Ionizing Radiation Protection (ICNIRP). These standards are based solely on short-term heating of body tissue (thermal effects) in a short period of time. They do not take into account any long-term biological effects (non-thermal effects) that may occur at levels below the current safety standards. Many scientists have criticised the existing thermal based standard because they fail to reflect the overall scientific evidence that shows biological effects that can occur at levels well below the current safety standards. Therefore, increasing numbers of scientists and doctors have been calling for new biologically based public safety limits do be developed. They believe the current standards do not sufficiently protect against health effects from chronic exposure to the rapidly increasing environmental level of EMR. The ARPANSA response letter acknowledges that they are aware of the 2007 ‘Joining the Dots’ report published by the Australian Democrats and the 2011 Parliamentary Assembly Council of Europe Resolution on the Potential Dangers of Electromagnetic Fields and their effect on the Environment. Based on thousands of studies, this resolution highlighted that “telecommunications and mobile telephony, appear to have more or less potentially harmful, non-thermal, biological effects on plants, insects and animals as well as the human body, even when exposed to levels that are below the official threshold values.” This resolution also expressed special concerns for the protection of children and electrosensititive people and made recommendations for WiFi, mobile phones, cordless phones, wireless baby monitors, etc. Although leading international scientists, researchers and doctors support this resolution by the Council of Europe, ARPANSA states, ‘Our view is that the statements made in regards to the evidence of harm from low-level exposure to RF EMR are not consistent with expert opinions of national and international bodies such as the International Commission for Non-Ionizing Radiation Protection (ICNIRP)...”. In regard to WiFi exposure the ARPANSA response letter states, ‘Under certain circumstances, for example, close proximity to Wi-Fi access points, exposure can become comparable to the localised exposure to the brain from a mobile phone handset.” It is precisely due to the known and suspected risks as indentified by thousands of scientific studies related to mobile phones and mobile phone masts that over 14 countries have restricted the use of mobile phones by children and advised precautions regarding their use. 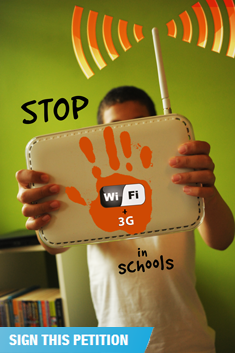 In addition to mobiles, the European Parliament, large groupings of scientists, the European Environmental Agency, Medical Associations, civil society groups etc are also calling for a ban on the use of WiFi in schools until it has been proven to be harmless. Their ‘Mobile phones and children’ fact sheet states, “It should be noted that none of the animal models in the research are perfect surrogates for the effects of RF EME on humans. There is still research required in this area. The difficulty for the researcher is devising novel approaches that satisfy ethics committees.“ Given that it is unethical to conduct the required tests on children in a controlled laboratory setting, then surely it is unacceptable and unethical to conduct this involuntary experiment on children in schools. Despite the fact that ARPANSA acknowledges the limited research and gaps in scientific understanding, there are no precautionary measures being considered or advised to protect children in schools from the potential long-term health effects. Based on ARPANSA’s advice and their current outdated safety standards, the Health and Education Departments totally disregard any potential long-term health effects from the use of WiFi in schools. The contradictory information provided by ARPANSA does not give parents confidence in their safety standards. Their mixed messages of assurances blended with cautious advice, creates further ambiguity and delivers an inconsistent message about the possible risks to children’s health. Our children and future generations should not have to suffer the consequences of these actions and ARPANSA’s failure to clearly advise the precautionary principle so that schools use safer hardwired connections. Major questions remain unanswered about the possible health risks to children that may arise from exposure to various man-made sources of EMR, and the long-term use of WiFi and laptops enabled with 3G connectivity at schools. While research and public discussion lags behind the vigorous roll out of wireless technologies in schools, we are allowing our children to be exposed to wireless radiation 6 hours a day, 5 days a week. With each passing day of government inaction children become increasingly vulnerable to the potential long-term health risks. The smarter option as advised by responsible governments and authorities overseas is to take a precautionary approach, reduce children’s EMR exposure and favour wired connections. Children are most vulnerable to exposure from EMR due to their thinner skulls, developing cells and their longer life-time of exposure.